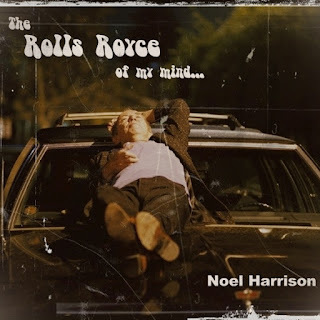 Noel Harrison released his first album of new material since 2003 after taking part in the RPM Challenge, an internet event which challenges musicians from across the world to record an entire album from scratch during the month of February. Following the rules of the RPM Challenge, the album has just 10 tracks. Because of the speedy way it was written and recorded, some of the tracks are obviously a little rough, but after a few listens, it stands up well next to 2003's Hold Back Time. The stand-out tracks are the incredibly beautiful U R the 1 (4 me) and Whimsey Blue while Wise Words from Mister Joe sees Noel reflecting on his time working with Mendelson Joe on his classic album Mount Hanley Song. The songs on this CD were all made up and recorded between February 1st and 28th 2010, for the RPM challenge. My son Will talked me into it. He has done it for the last two years. “You can do it, Dad!”, he ordered. I’m glad I did now, though there were moments when I considered using senility as an excuse to quit. There should have been more instruments added... fiddle, accordion, etc etc but we ran out of time. I’d like to thank Will for his support and encouragement, my wife Lori for her patience, my son-in-law Julyan for the art work, Bill Birks for coming to my rescue with his Ashburton studio, and all the old songwriters whose melodies and lyrics inspired me to seek out my own versions of their styles. Noel and his son Will also took part in the 2011 RPM Challenge under the name Manic and Panic. The album they recorded, New Antennas, has not been officially released by Noel as it ended up being more a series of sonic experiments than a focused album. Noel recorded one new song as part of the RPM Challenge in 2012. The track was the humorously titled The Rolls Royce of my Mind. To listen to the song click on the player below.